On October 30, Yep Roc will release ‘Sam Phillips: The Man Who Invented Rock ‘n’ Roll,’ a companion to Peter Guralnick’s forthcoming biography of the same name, and a personal, idiosyncratic survey of one of the most important bodies of work in recording history. The 2CD/3LP set features songs hand-selected by Guralnick, who also wrote an exclusive track-by-track essay for the release. Mostly spanning the years 1950 – 1961, the set shines a light on Phillips’ unique approach to recording, his cosmic genius, and revolutionary role in the evolution of blues, country, r&b, gospel and the birth of rock ‘n’ roll. Guralnick’s new book on Sam Phillips, to be released November 10 by Little, Brown and Company, is his first in ten years. Kirkus Reviews has already called it “a monumental biography.” It follows his acclaimed two-part biography of Elvis Presley, ‘Last Train to Memphis’ and ‘Careless Love.’ Guralnick will launch an extensive book tour in November with dates to be announced soon. Additionally, Guralnick has co-curated a new exhibit at the Country Music Hall of Fame, ‘Flyin’ Saucers Rock & Roll: The Cosmic Genius of Sam Phillips,’ which opened August 28, and runs through June 12, 2016. 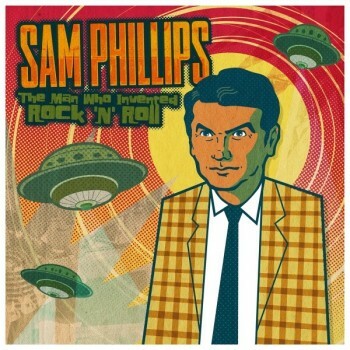 Pre-order Sam Phillips: The Man Who Invented Rock ‘n’ Roll on CD/LP, or bundle with a copy of Peter Guralnick’s companion biography and an exclusive t-shirt. Grant-Lee Phillips’ New Album Widdershins to release on Feb. 23, 2018! Available for Pre-Order NOW!